BETWEEN 1900 AND 1945, a typical middle-class American home comprised approximately 1,000 square feet and had no more than two bedrooms—one for the parents, one shared by the children—and one bathroom. Tens of thousands of parents raised families in such homes, in what seemed to them relatively affordable comfort. Today these homes, surviving in inner-city suburban neighborhoods all over the country, are considered small—suitable for a single person or, at most, a married couple. Yet they are still prized as models of gracious, affordable living, and they have proven to be quaint but durable forerunners of sustainable residential design and construction for the 21st century. That, it turns out, is no accident. 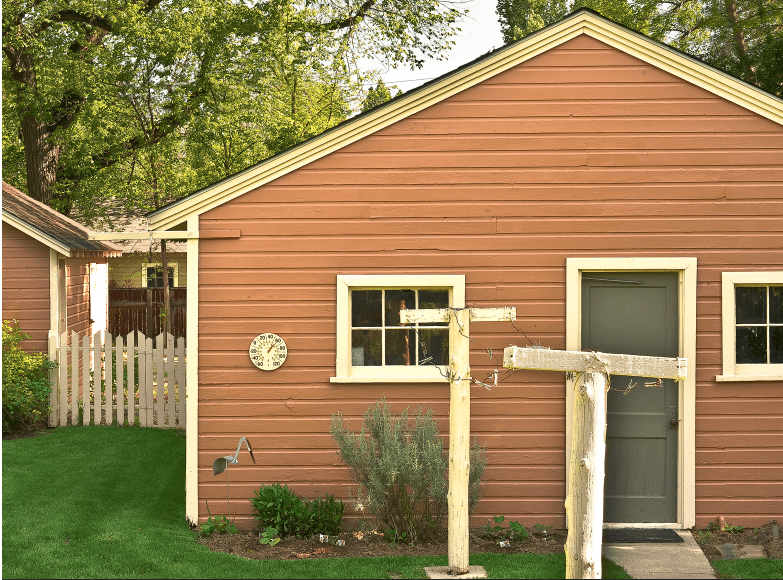 The bungalows of yesteryear have been able to last for a century because their designers and builders incorporated many elements of an ecologically sensitive approach to design that made them so. With the middle-class bungalow, ecological design took the form of large eaves, deep front porches and generous patio overhangs that sheltered the house from the elements. Those features helped make it what we now describe as energy efficient —easier to heat and keep cool. In my own home, a classic 1922 Craftsman brick bungalow in Fort Collins, Colo., 60 miles north of Denver on the Great Plains dry steppe, my 19-by-7-foot porch shades the front of the home in the summer. Because the house faces south, sunlight can penetrate the front of the house during the winter, helping to warm it. The walls of double courses of bricks insulate the interior, helping to keep it warm in the winter and cool in the summer. The attic space provides further insulation. The task of ecological design is to create land uses and structures that are deeply adapted to particular places—to the local climate, topography and flora—drawing on local building materials, practices and traditions. Successful ecological designs derive in large part from understanding the natural processes that distinguish different regions, then designing structures and land uses accordingly. This approach is the opposite of one-size-fits-all mass production, in which standard templates are replicated with little regard to place. Ecological design is not new. Aboriginal peoples practiced it for millennia in their vernacular architectures. A well-known example of North American buildings designed to heed their regional climate are the Anasazi cliff dwellings of the Southwestern U.S. These high-mass adobe dwellings were built in south-facing caves that afforded passive solar gain in the winter and blocked heat gain in the summer. 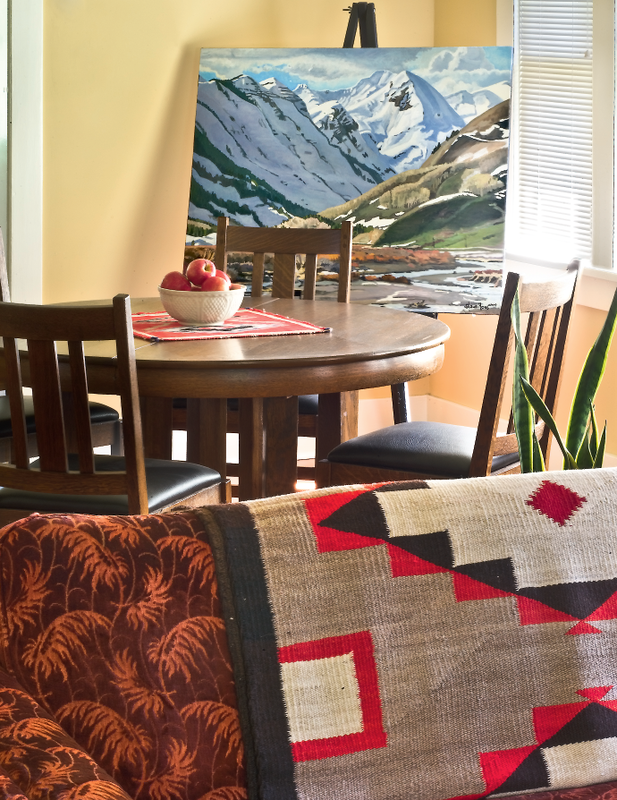 Local materials were used in ways that artfully maximized human comfort. In the pueblos of Zuni, Taos, Acoma and elsewhere in the Southwestern deserts, the Anasazis’ successors used adobe and thermal mass to create pueblo dwellings that were easily kept cool in the open desert. Today, adobe homes in Albuquerque, even those lacking insulation, stay 15 to 20 degrees cooler than the midday peak temperature, often eliminating the need for air conditioning. In other regions, homes constructed of brick, like mine, have the same effect. In regions where massing was an impractical method of thermal control, other measures were adopted. The Rocky Mountain Institute’s 1995 Primer on Sustainable Building provided general guidelines on using building shape and orientation to, for example, capture sunlight for passive solar heating and lighting in cold and temperate climates. Eaves and windows can be placed so that winter sunlight reaches into the dwelling but summer sunlight will not. Deep covered porches provide additional shading from their overhangs and shelter outdoor gatherings during hot spells. Ecological design practices can also have the effect of enhancing a region’s (or, for that matter, a neighborhood’s) sense of architectural identity—its visual character—which has become so sorely degraded over the past century of suburban sprawl. For architects and builders who are sensitive to regional ecology, a structure’s materials, colors and visual style assert its “fitness”—its appropriateness—for its built environment while simultaneously enhancing the environmental fabric. Over the past 30 years, encouraged in part by incentives to restore historic properties and protect historic neighbor-hoods, migrants from the suburbs have been moving back to older urban communities. For many, like me, the com-forts of home are amplified by links to history. Living in a house like mine helps me satisfy my desire to make sustainable use of resources. (I’m still driving the Volkswagen Bug I bought new in 1964.) While I may rely on high-tech appliances in almost every room of the house, the objects of my greatest affections are traditional artifacts imbued with a sense of history: an old enamel-top kitchen table from the Great Depression era, my great-grandmother’s rocker, Jadeite glassware, an Arts and Crafts side table, a Navajo rug. University. 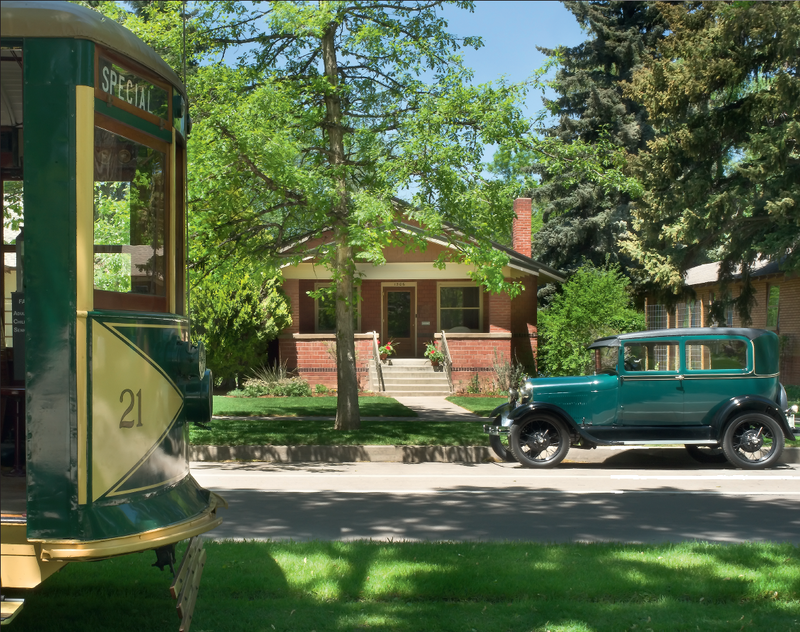 A restored 1919 trolley operates on West Mountain on weekend afternoons from May through September. From my home, I don’t need a car to make most local daily or weekly trips. A neighborhood grocery is two blocks away. The university, a library, restaurants, coffee shops and downtown shopping are within walking or biking distance. Close by are a park and an elementary school. These features are attracting others as part of a green movement to renovate and build in Old Town. I am the sixth owner of the bungalow, which was built for W. Jackson in 1922 at a cost of $4,000. I was already living in a mid-1920s Craftsman-style bungalow when it became available 10 years ago. 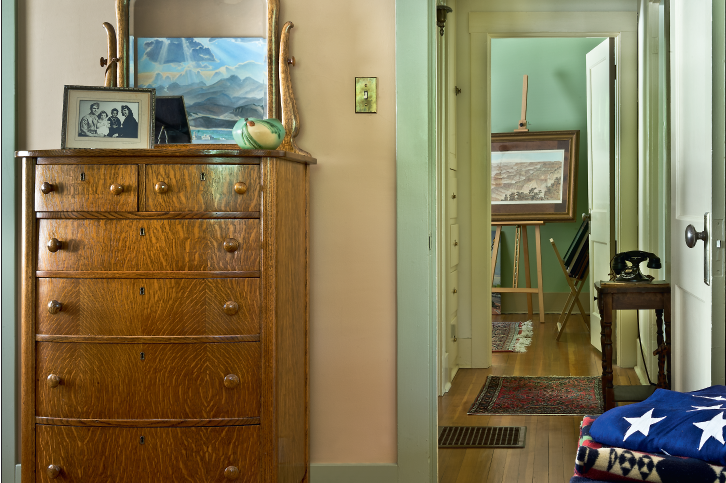 It features original Southern yellow–pine flooring and built-in drawers and cupboards conveniently accessed from the hallway between the bed-rooms and bath. An undivided living-dining room, a kitchen, and a partial-width front porch complete the plan. There is no entry hall; the front door opens directly into the living room. The framing and cladding of the one-car “Model A” garage in back are wood. A clothesline stretches between two poles in the backyard. In a small garden, vegetables ripen. Fortunately, the exterior needed little work. Windows are double-sashed; to restore sustainability, I replaced old aluminum storm windows and doors with wooden ones, which are correct for the period and more energy efficient. Inside, I’m trying to bring back the spirit of the original construction. The process, now almost complete, has en-tailed a combination of undoing poor remodeling jobs to restore the home’s original character and adding plumbing fixtures, furnishings and paint colors from the bungalow era. I refinished the beautiful pine floors that were preserved under wall-to-wall carpet throughout the house. When I removed the carpet, I discovered that a wall separating the kitchen from the back porch had been removed sometime in the past, leaving a gap in the flooring. I wove in matching flooring salvaged from another older home to fill the gap. I saved original hardware from cupboards, doors and windows, and retained original light fixtures, where possible, or located fixtures from the period. In the basement I found the original bathroom sink and toilet, which I reinstalled. The medicine cabinet was missing, and the recess in the wall had been closed up, so I bought a reproduction from Rejuvenation in Portland, Ore. Several two-panel doors were also missing; I found suitable replacements at an architectural salvage company in Denver. Next, after consulting Robert Schweitzer, the authority on bungalow colors, I turned my paintbrush onto the plaster walls of every room in the house. Unfortunately, a previous owner had painted every room white, including the wood trim and doors. Rather than strip the wood down, I decided, in consultation with Schweitzer, to paint it a color to complement the walls. 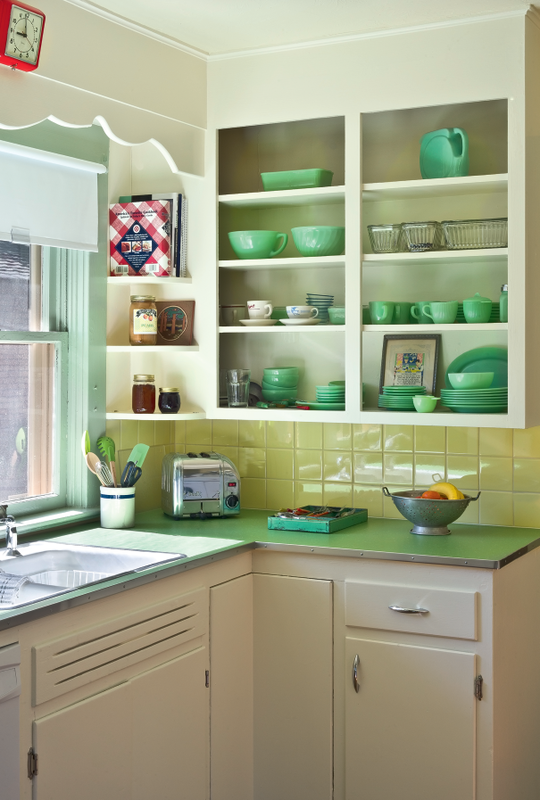 The kitchen had been remodeled in the 1950s, and a subsequent owner had installed butcher-block countertops and painted every other surface white. Rather than completely rip out everything and start over, I decided to install linoleum countertops with metal-trim edging and used a “cream-and-green” paint scheme typical of that era. (For the countertops, I consulted with Tim Counts, author of the Summer 2001 [No. 30] American Bungalow article “Creating a Classic Bungalow Kitchen.”) I found a 1950 Montgomery Ward electric range to complete the look. The furniture is eclectic, most of the pieces from the early 20th century. A few pieces handed down from my great-grandparents reflect the ambience of the bungalow era. Fundamental in the Arts and Crafts philosophy is the idea of creating things by hand, and in this spirit I display American Indian objects: Navajo rugs, Hopi pots and katsi-nas, and Pima baskets. The original paintings and vintage prints are by local artists. Throughout, I was guided by Tim Counts again, here by his Fall 1997 (No. 16) AB article “The Affordable Bungalow Interior.” He points out that the early owners of these houses didn’t fill them with expensive furnishings, such as Stickley furniture. Their goal was to create dwellings that were both artistic and affordable. Now 89 years old, my home was built to last. It is truly a sustainable piece of architecture, “a superb example of small-scale brick Craftsman dwelling,” according to the surveyor who evaluated it in 1998 for the Westside Neighborhood Survey. One day, I hope to pass it on in a little bit better condition than it was in when I found it. Its time has come. Robert G. Bailey, Ph.D., is an ecological geographer and author who works for the Rocky Mountain Research Station, U.S. Forest Service, in Fort Collins, Colo. This article draws on his book Ecoregion-Based Design for Sustainability (Springer 2002). He thanks his daughter, Laura Bailey, for her assistance with this article.